With longer days and sunshine, I am looking for clean green foods to eat. Fresh food for spring that matches the flavours, textures and colours I am looking for on my plate. There is something about the change of seasons that opens the way for doing things differently – for fresh starts or new beginnings – and spring especially seems to inspire me to up the anti on healthy living and eating. It seems that if I can eat simple, fresh, delicious food, and feel satisfied, I have made a good start toward achieving my goals. Give me fresh herbs and green vegetables teamed with lemon chilli, garlic and some beautiful fresh mozzarella and life does seem good! 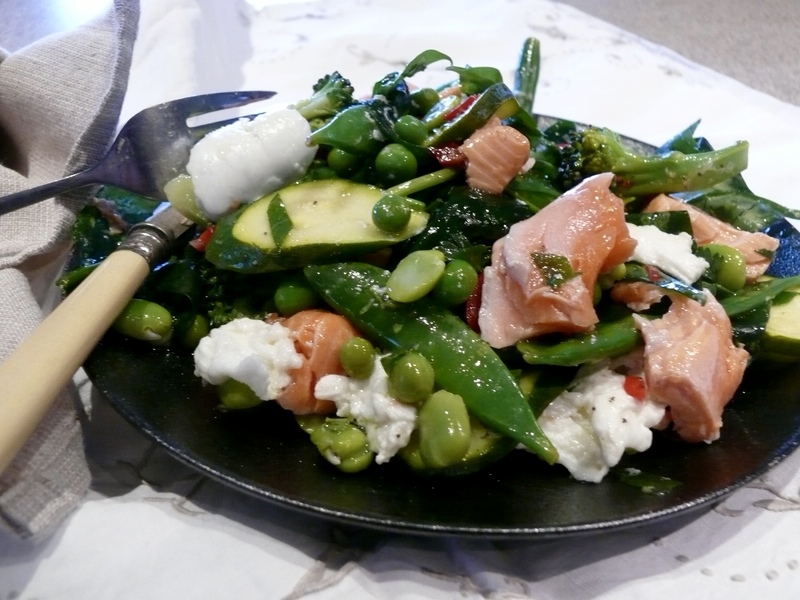 In real life, the spring vegetables are still a few weeks away, so there are some cheats in this salad with the frozen beans and peas. I love the sweetness that the peas give, and as there is only a small amount of broad beans, a little token shelling of them will go a long way. 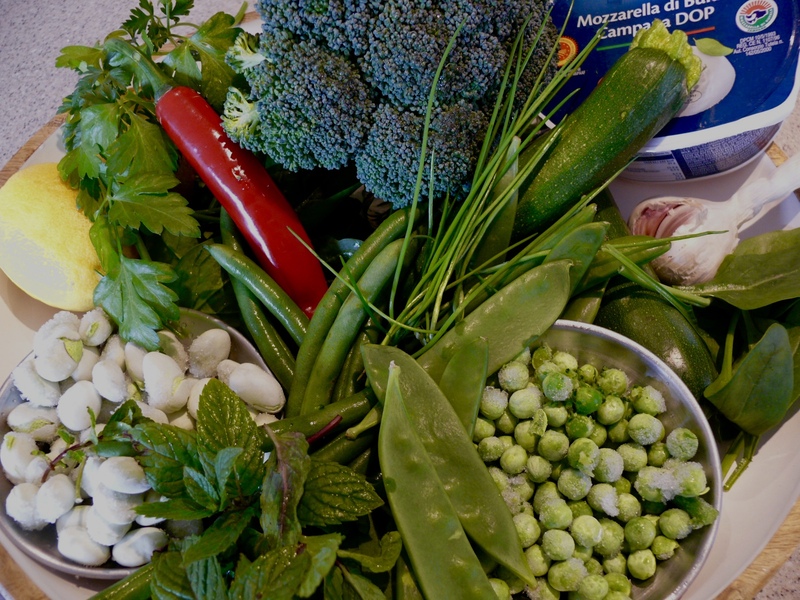 It is my hope that people know just how much you love them when you go to the trouble of double podding broad beans. But if not, at least I enjoy the difference it makes. This salad is brought to life with lots of lovely fresh lemon juice, olive oil, mint and finished with a hint of garlic and chilli. As always, it is seasoned with salt and pepper. I think this point, in the finishing off of all your dishes, is the time to bring out those really special salts and freshly ground peppers, as this is when you will really taste the difference they bring to your food. There is something worth noting about the way a lemony dressing can bring a bowl of green vegetables to life. It is one of those gems of food knowledge that stands the test of time and works in so many ways – think about tabouleh just for one . 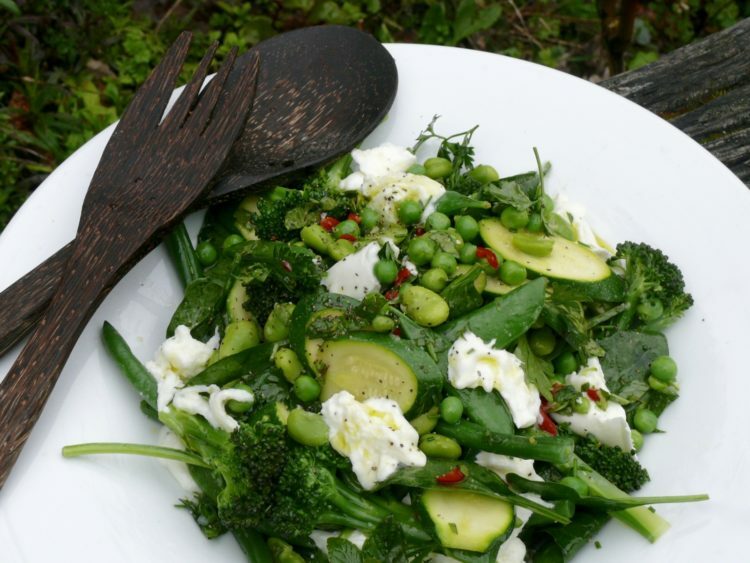 I remember my daughter Isabel serving a bowl of freshly steamed beans with just a squeeze of lemon and olive oil over them, and marvelling at the the simplicity and deliciousness, and probably for the first time really understanding that lemon – green vegetable – magic. This was probably also a mindful eating moment. One of those moments which I forget, in the excitement of eating, to do as often as I should or would like to. For the pescatarians out there, sit a fillet of salmon on top, or flake the salmon through the salad and serve as a shared platter. The beautiful pink colour looks amazing and the flavours work. 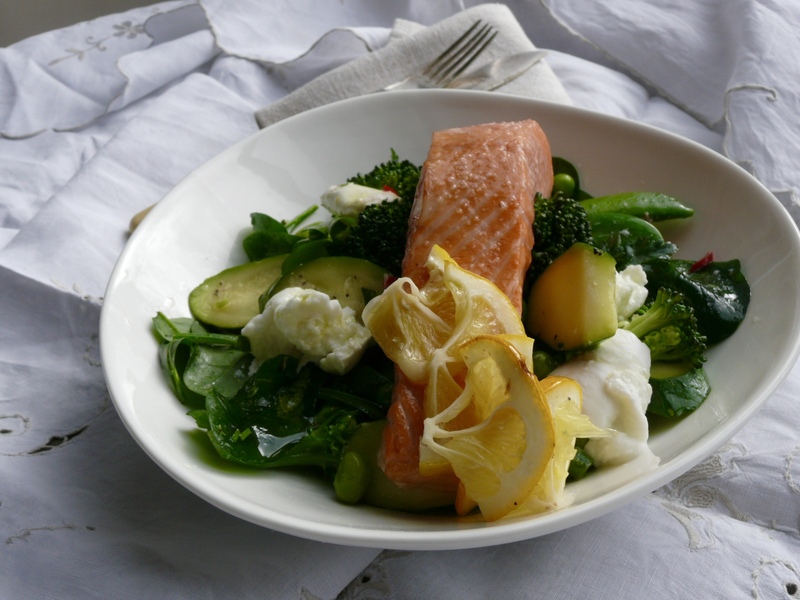 With, or without salmon, it is a delicious hint of spring. Pick the greens that look freshest on the day, (you certainly don’t need all of these), and you may see other greens that are of better quality and price on the day. Cook your salmon now if you using it – I seasoned and cooked mine in a hot oven 220’c with a couple of slices of lemon for 5 minutes. But you could easily choose to steam it after you steam your vegetables, or pan fry it. Do what you feel comfortable doing. Bring a small pot of water to the boil and cook your broad beans in here for approximately two minutes. Drain and peal them and set aside until the rest of the vegetables are prepared. 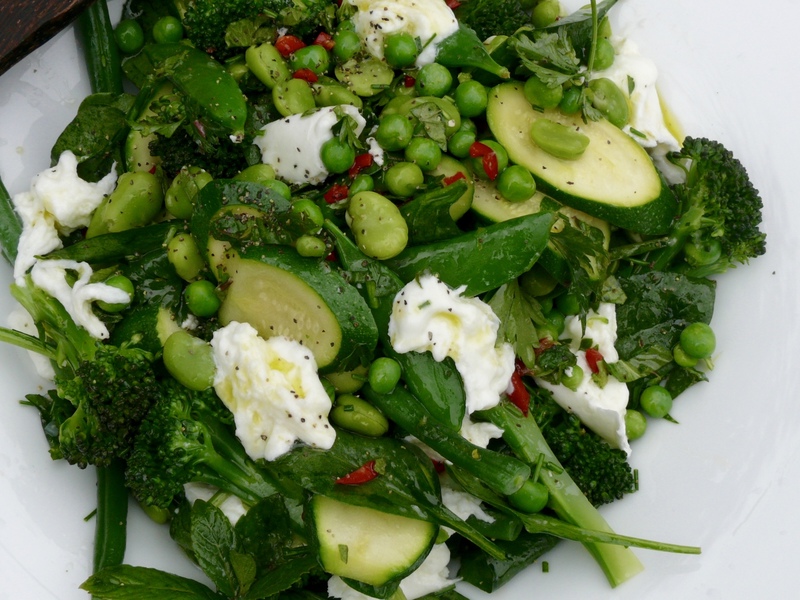 Steam or blanch your broccoli, beans, courgettes, peas and snow peas – I used one large steamer and added the vegetables one at a time in the order listed cooking for about 30 seconds after each addition to ensure they stayed crisp and green. Once cooked I then put them quickly into iced water to stop them cooking any more. Drain your vegetables, using ice water if necessary to halt the cooking. Add all your vegetables, herbs and salad greens to the bowl and gently toss to coat. Tear your mozzarella into the bowl and very gently fold into the salad. Turn the salad out onto your platter and serve immediately. Like most salads this will taste best at room temperature rather than icy cold. At the end of the day, this is as always, an idea and open to your interpretation and there are so many ways you can build on this. So go and check your refrigerator, buy some greens and lemons and enjoy.